Race, gender, culture, sexual identity, socioeconomic status, religion: Fordham is committed to diversity in all dimensions. Working to understand and respect that which makes each of us unique is an essential part of a college education. It’s part of our Jesuit mission, to be both Catholic and catholic: a community that welcomes and honors all who come to us—whether as students, faculty members, or members of our staff. We pledge to treat and to surround every member of the campus community with reverence, respect, and deep affection. In fall 2015, Joseph M. McShane, SJ, president of Fordham, formed a Task Force on Diversity to study the climate on campus, review programs in place that nurture a more welcoming and affirming culture on our campuses, and develop actionable recommendations that will enable Fordham to further live up to the ideals of a Jesuit university. 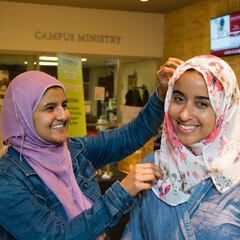 Throughout the year, the Office of Multicultural Affairs organizes events that celebrate Fordham’s rich diversity on campus and in New York City, from heritage-month programs to interfaith ceremonies to local traditions. 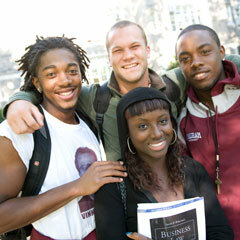 Learn more about how we bring Fordham’s community together. The Faculty Senate has also been working with various constituencies across the university to foster dialogue around issues of diversity. In the fall of 2015, the Faculty Senate renewed the charge of the Task Force on Gender and Race Equity and Faculty Diversity and Retention. The Senate convened a joint meeting of the Senate Task Force, the Faculty Life Committee, and the Student Life Committee. In November, at the Senate’s invitation, six undergraduates spoke about their experiences of diversity at Fordham.